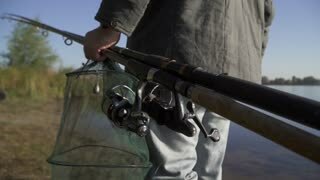 Search Results for "fish net"
A man carries fishing rods and fish nets close up. Slow motion. VARANASI, INDIA - 25 FEBRUARY 2015: Men collecting fish in net at ghat in Varanasi, with children sitting aside. 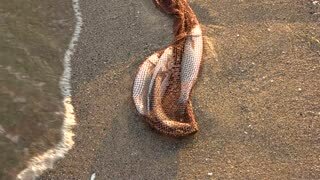 Net with fish on sand. Clean sea water, top view. Stop marine poaching. Net with fish on seashore. Water and stones. Sea fishing tips. Fisherman catches a fish. Marine hobbies. Man is washing the net in the sea. Man is washing the net in the sea. Fisherman catches a fish. Marine hobbies. 1950s: UNITED STATES: men take fish from net on shore. Migrating fish in net. Spot fish in net. 1950s: Boy firmly holds fishing rod, man catches the fish with net and holds it, the fish struggles inside the net, man tries to remove the hook from the fish inside the net. 1950s: Man inside canoe holds fish net with fish inside that moves. Hands show the mouth of a fish. Fish swims on the water surface, fish struggles and tries to escape from the hook. UNITED STATES 1950s: Close up, fish caught on hook / Close up, fish in net / Man on boat pulls up fish in net. 1950s: UNITED STATES: fish move around in net on beach. Men sort out fish in nets. Crate of fish on beach. 1950s: Man on fishing boat pulls net with fish from water. Man pulls fish from net and holds it up. Net pulled from water with lots of fish in it. 1940s: Power windlass pulls fish and nets onto boat. Large cod fish in nets are pulled from water. Fisherman net repair editorial. BARI, Italy - MAY 7, 2010: a fisherman repairs the grid of a fish net. Part of the daily job at sea consists of repairing nets with a thread and a needle. Aerial view fishermen catching fish by net from fishing boat in sea. Fisherman fishing fish with net from boat on sea shore drone view. UNITED STATES 1950s: Close up of man with fish / Man takes fish from net, drops fish / Splashing in water / Hand throws fish in water / View of river / Man inspects net. 1960s: Man holds bar as he rides boat. Boat sails. Men labor off side of boat, fishing boat beyond. Large net flaps off side of boat in water. Men on boat haul fish net. Fish in swaths under water. 1950s: Men haul up net. Man scoops fish from net, dumps fish into boat. 1930s: UNITED STATES: fish move around in net. Fish caught in nets. Fishing boats ready to go to sea. Fishing boats in harbour. Drone view fishing with net from boat in sea. Fishermen in boat catching with fish net in sea water. Fishing and hunting in ocean. Fisherman is repairing the fish net. Needle with thread in fisherman mouth until repairing net for angling. 1970s: Man with gear strapped to back, dips pole with net into water. Net under water collects fish. Fish in net are poured into basket. 1960s: Pelican lands in ocean water. Pelicans float on ocean waves. Men stand in ocean and drag net. Fish flop in net. Men and women work on boat. Men sail boat to shore. Hands wrap fish in leaf. 1950s: Tarpon swim frantically in large net being pulled from sea by two boats. Men pull fish from net into boat. Men carry fish from boats. 1950s: Man in small fishing boat removes fish captured in pole nets. Man tosses shad onto pile of fish in boat. Man in small fishing boat removes fish captured in pole nets. 1950s: Line of men standing in row on edge of boat while smaller boat in front of them helps to pull large net full of fish from water. 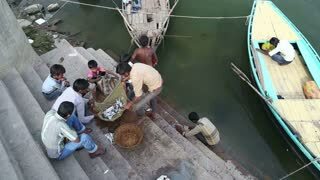 Men pull fish from net into boat. 1950s: Men scoop fish from net into boat. Men pull net up to boat, dump fish into boat. Map of Virginia and Chesapeake Bay. 1950s: Men scoop fish into nets, dump fish into boat. Men scoop fish out of boat. 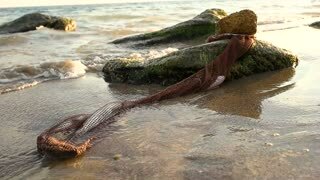 A steady wide shot of the fish net on the ocean.